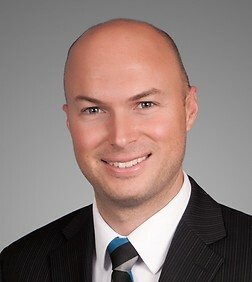 Eric Gill is an associate in the Intellectual Property (IP) Practice Group in the firm’s San Diego (Del Mar) office. Eric's IP practice draws heavily on his industry experience and education in electrical engineering, and emphasizes patent litigation and post-grant proceedings, as well as strategic IP portfolio development and counseling (including patent drafting and prosecution). His practice further encompasses handling soft IP and related litigation and providing counsel, due diligence, and analysis in connection with technology licensing, patentability, freedom-to-operate, and patent portfolio landscaping. Eric’s patent litigation practice has recently focused extensively on standard-essential patents and related FRAND issues in the wireless and cellular technology spaces. For example, he has litigated numerous patents across a broad spectrum of technologies in the 2G (GSM/GPRS/EDGE), 3G (UMTS/WCDMA/HSPA), and 4G (LTE/LTE-A) cellular standards, including speech coding, adaptive modulation, random access, ACK/NACK, HARQ, MIMO, carrier aggregation, multimedia broadcast multicast service, FDD, TDD, CDMA, and OFDM. Additionally, he has litigated patents directed to such technologies as GPS and location services, control programs for wireless devices, power management and power control circuitry, image sensors and graphics processors, audio/video codecs, receiver architecture and circuitry, spinal surgery tools, and online mortgage exchanges. Eric is also a registered patent attorney and represents clients before the US Patent Office, including in PTAB proceedings (e.g., Inter Partes Reviews) and in drafting and prosecuting patent applications. In this regard, he deals in such technologies as wireless communications, analog and RF circuits and systems, Bluetooth, semiconductors, MEMS, augmented and virtual reality, and mechanical and medical devices. Before joining the firm, Eric landscaped patent portfolios in the telecom RF/analog space when he worked in the IP strategy group of one of the world’s leading semiconductor and wireless-technology companies. Before becoming a lawyer, Eric worked in industry as a microwave and RF design engineer at Northrop Grumman, where he designed microwave integrated circuits and RF systems for aircraft and satellite communications and for counter-improvised-explosive-device-warfare technologies. He also worked as an RFIC designer at NextWave Wireless, a San Diego semiconductor company that developed chip-sets and wireless technology for WiMAX and 4G LTE. Certain LTE- and 3G-Compliant Cellular Communications Devices, Inv. No. 337-TA-1138 (USITC). Represents HTC in an investigation involving five alleged standard essential patents (SEPs) asserted to cover the 3G UMTS and 4G LTE/LTE-A standards. INVT SPE LLC v. HTC Corp. et al., No. 2:17-cv-3740 (DNJ). Represents HTC in a seven-patent infringement action relating to alleged SEPs asserted to cover the 2G EGPRS, 3G UMTS/WCDMA/HSPA, and 4G LTE/LTE-A standards. HTC has counter-claimed for breach of FRAND. Evolved Wireless, LLC v. HTC Corp. et al., No. 1:15-cv-543 (D Del). Represents HTC in a five-patent infringement lawsuit relating to alleged SEPs asserted to cover the 4G LTE standard. HTC has counter-claimed for breach of contract, alleging that Evolved Wireless failed to license its patents on FRAND terms. TCL Commc'n Tech. Holdings, Ltd. et al. v. Telefonaktiebolaget LM Ericsson et al., No. 8:14-cv-341 (CD Cal). Represents TCL in a breach-of-contract and declaratory-judgment action relating to ETSI’s IPR Policy and Ericsson’s obligation to license its 2G GSM/GPRS/EDGE, 3G UMTS, and 4G LTE SEPs under FRAND terms. Prestige Flag Mfg. Co., Inc. v. Golf Solutions I, LLC, No. 3:18-cv-98 (WD Wis). Represented Prestige in a case for design patent infringement and federal and common law unfair competition. McCree’s Multi Services, LLC v. Poway Weapons & Gear, Inc. et al., No. 3:17-cv-1749 (SD Cal). Represented Poway Weapons & Gear as local counsel in a two-patent case involving firearm technology. Hitachi Maxell, Ltd. v. ZTE Corp. et al., No. 5:16-cv-179 (ED Tex). Represented ZTE in an eight-patent infringement lawsuit relating to patents alleged to cover aspects of cellular phone technology such as power management circuitry, image sensors and graphics processors, transmit power control circuitry, and multi-format, multiplexed audio/video decoding receiver circuitry. Ericsson Inc. et al. v. TCL Commc'n Tech. Holdings, Ltd. et al., No. 2:15-cv-11 (ED Tex). Represented TCL in a five-patent infringement action relating to patents Ericsson alleges cover aspects of cellular phone hardware and the Android OS, including multimode direct conversion receiver circuitry, A-GPS, and control programs for wireless communications. TCL counter-sued on two patents relating to LTE cellular network infrastructure and base stations. TCL obtained a stay of the trial after it filed 17 IPRs against Ericsson’s asserted patents and the PTAB instituted all 17. Ericsson Inc. et al. v. TCL Commc'n Tech. Holdings, Ltd. et al., No. 2:14-cv-667 (ED Tex). Represented TCL in a two-patent infringement action relating to speech coding and modulation patents Ericsson alleges cover the 2G, 3G, and 4G standards. TCL counter-sued on two patents related to LTE cellular networks and communications. TCL got the case transferred to CD Cal, consolidated with the FRAND case, and stayed pending the outcome of that case. Prestige Flag Mfg. Co., Inc. v. Par Aide Products Co., No. 14-cv-2711 (SD Cal). Represented Prestige in an action for design patent and trade dress infringement, and state and federal unfair competition. Prestige Flag Mfg. Co., Inc. v. Standard Golf Co. et al., No. 14-cv-1574 (SD Cal). Represented Prestige in an action for design patent infringement. Abdou v. Alphatec Spine, Inc., No. 3:12-cv-1804 (SD Cal). Represented Alphatec Spine in a patent infringement action. LendingTree, LLC v. Zillow, Inc. et al., No. 3:10-cv-439 (WD NC). Represented LendingTree in a six-week jury trial over antitrust and patent infringement claims. Prime Focus Creative Servs. Can. Inc. v. Legend3D, Inc., No. IPR2016-01243. Represents Patent Owner Legend3D in opposing a challenge to a Legend3D patent related to image processing. TCL Corp. et al. v. Telefonaktiebolaget LM Ericsson, Nos. IPR2015-1584, IPR2015-1600. Represented Petitioner TCL in its challenge to an Ericsson patent directed to multimode direct conversion receiver circuitry. The PTAB invalidated all the challenged claims and denied Ericsson’s request for rehearing. TCL Corp. et al. v. Ericsson Inc., No. IPR2015-1583. Represented TCL in its challenge to an Ericsson patent directed to control programs for wireless communication devices. The PTAB invalidated all challenged claims. TCL Corp. et al. v. Telefonaktiebolaget LM Ericsson, Nos. IPR2015-1650, IPR2015-1772, IPR2015-1878. Represented TCL in its challenge to an Ericsson patent directed to using QoS parameters in A-GPS for mobile terminals. The PTAB invalidated all challenged claims. Represented petitioners and patent owners in IPR proceedings regarding patents related to chemical compounds for pharmaceutical and industrial/commercial applications. Prestige Flag Mfg. Co., Inc. v. Golf Solutions I, LLC et al., No. 3:14-cv-2945 (SD Cal). Represented Prestige in an action for breach of contract. Golf Solutions I, LLC v. Prestige Flag Mfg. Co., Inc. et al., No. 14-cv-869 (WD Wis). Represented Prestige in an action for breach of contract. Konstantino v. AngioScore, Inc., No. 9681-CB (Del Ch). Represented AngioScore in an action for advancement of legal fees related to AngioScore’s claims for patent infringement, breach of fiduciary duty, and unfair competition. RamSoft, Inc. v. Imaging Advantage, LLC et al., No. 14-cv-335 (CD Cal). Represented RamSoft in an action for breach of contract, copyright infringement, copyright management information removal/alteration, trade secret misappropriation, and intentional interference with contract. Cobra Systems, Inc. v. Accuform Manufacturing, Inc., No. 13-cv-5932 (CD Cal). Represented Cobra in an action for copyright infringement, copyright management information removal/alteration, trademark infringement, state and federal unfair competition, and breach of contract. Representative clients include Dexcom, Disney, JayBird, MasterCard, and Western Digital. Provided strategic counseling to major handset manufacturers regarding cellular SEPs and FRAND issues. Provided strategic counseling regarding the scope and validity of patents related to thin-film transistor and pixel display circuit technologies for LED TVs.